"Growing up in Toronto you become a custom to being around passionate sports fans. When it comes to the Toronto Raptors it almost goes hand-in-hand with hip-hop music." Toronto hip-hop artist, Peter Jackson has released his new Toronto Raptors playoff anthem, "Rap City" online at https://youtu.be/FKgtlGp0J_Y. The video for "Rap City" comes as the Toronto Raptors face off against the Indiana Pacers in game two of their NBA playoff series. Peter Jackson has printed 50,000 copies of the album to be handed out at each of the Toronto Raptors Playoff games. "Growing up in Toronto you become a custom to being around passionate sports fans. Growing up in the late 1990's & early 2000's that means you were a Vince Carter fan in Toronto. When it comes to the Toronto Raptors it almost goes hand-in-hand with hip-hop music," says Peter Jackson. "From the DJs that play live at the games to the music that is the soundtrack to the highlight reels, it's just something that's always been right there for me." This song is a follow-up to Jackson's 2015 Raptors tribute record and video "We The North", which made huge noise across the city and with Raptors fans. As a huge fan of the Toronto Raptors and supporter of his home town, Jackson has some special surprises planned for fellow Raptors fans with the release of the "Rap City" record and video. Peter Jackson is often referred to as “The hardest working rapper in Canada”. 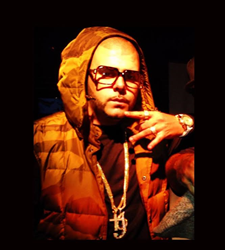 Known for his intense work ethic both in the studio and on the road, Jackson has spent the last several years touring with the likes of French Montana, Jadakiss, and Akon. His latest album "Two Sides To A Story" was released earlier this year and is the first posthumous release of Brooklyn from the award-winning hip-hop group Winnipeg’s Most, who tragically took his own life back in September. The album peaked at the top of the iTunes Hip-Hop charts and has garnered significant critical acclaim since its release. Peter Jackson's latest video "Godly" featuring Riff Raff can be seen in rotation on Much Music.